3 bedrooms, 2 bathrooms villa with pool and sea view near Sorrento. VILLA BIANCA is a splendid villa with 200 square meters which is situated just a few kilometers from the center of Sorrento. 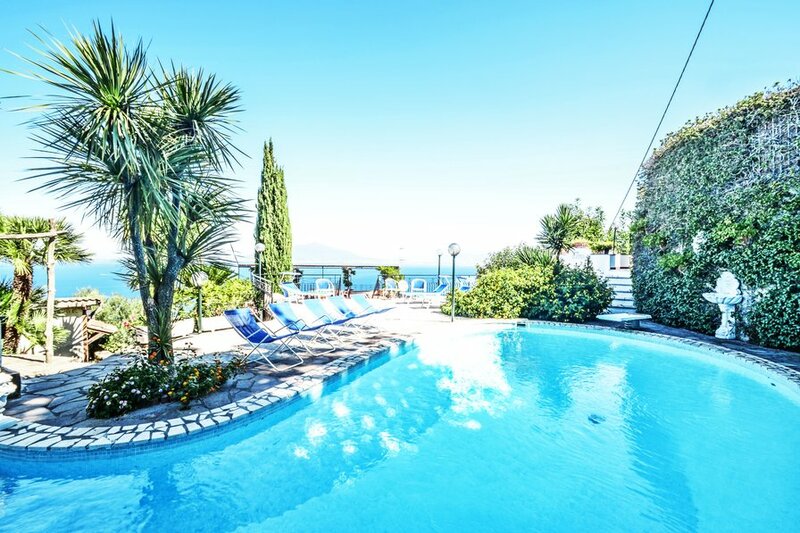 The villa offers wonderful views of the sea, the Vesuvius and of Sorrento. It can host up to 8 people. There is plenty of out- door space with large terraces overlooking the sea, a BBQ grill, a wooden pizza oven complete with a private swimming pool. The Villa has air conditioning in every room, heating and Wi-Fi internet. There is also private parking for 3 to 4 cars. Villa Bianca is approximately 4 km away from Sorrento, going in the direction of Sant'Agata Sui Due Golfi. In less than 200 meters you will find some great local restaurants and a coffee bar. The SITA bus is located just 20 meters away, which can bring you to Sorrento, Sant'Agata Sui Due Golfi, Positano and Amalfi every 30 minutes. The closest beach is the Sorrento beach just 4 km away. At a 7 km distance, you will find the Nerano beach, where you can enjoy a panoramic view while tasting the best typical dishes of the area in one of the many local restaurants. The closest supermarkets and stores are in Sant'Agata Sui Due Golfi just 3 km away. The location is also ideal for those who like to walk. You may want to plan a stroll along the road towards Sorrento or Punta Campanella where you will feel the authentic atmosphere of the Sorrentinian Coast line and admire the breath taking views. You may access the villa from the main road through an automatic electric gate. You do not need a car while staying at Villa Bianca 1, however, if you have one, you may park it in the villas' private parking. You may reach the villa by going up approximately 20 steps from the drive way. THE SWIMMING POOL is located in the upper part of the villa. It measures 12 meters in length, 2,5 meters in width and 6,5 meters in depth and it has a splendid view of the sea, Sorrento and the Vesuvius. It is equipped with chairs and long chairs and benches. The pool is open from May until the beginning of November. You will find an outdoor shower with cold water and a washroom with toilet. The pool can be accessed from the villa by going up seven steps. THE FIRST TERRACE is located in the upper section of the villa (roof top) measuring 200 square meters. It is furnished with tables, chairs, long chairs and is partially covered by a bamboo roofing. From here you will be able to admire a wonderful view of the sea and the Gulf of Naples. It can be reached from the villa by going up seven steps. THE 2nd BEDROOM has a double bed 8upon request can become two single beds) with armoire and a desk. It can be accessed from the hallway. It has air condition and heating. You may access the balcony (in common with the other rooms) though French doors and admire the beautiful view of the sea, Sorrento and the Vesuvius. THE 3RD BEDROOM has a double bed (upon request can become two single beds) with armoire and a desk. It can be accessed from the hallway. It has air condition and heating. You may access the balcony (in common with the other rooms) through French doors and admire the beautiful view of the sea, Sorrento and the Vesuvius. THE BALCONY is 12 meters in length by 2 meters in width and has a spectacular view of the sea. It is furnished with a table with three chairs and a bench. It can be accessed by all three bedrooms. THE GYM which will help you stay in great shape after enjoying great dinners at the villa or in restaurants. There are 3 exercise machines in a covered area with an amazing view of the sea.